Is this not the yummiest quilt you ever did see? Well, sadly I did not win it from among the 20,000 some entries, but it got my mind spinning. I have not been able to stop thinking about it since laying eyes on it. I don't quilt, and really never planned to due to my impatience and supreme lack of perfectionism, but I am feeling that changing. 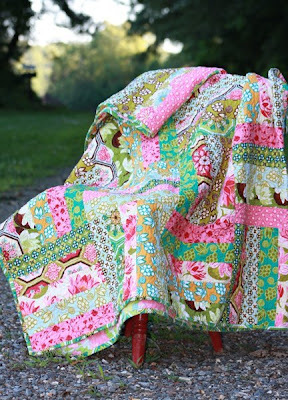 All I have to say that if I ever do make this quilt, you had better bet that I will not be giving it away! Honestly, the creator of it is my new favorite person. On a whim, I emailed her asking what pattern she used to make it. I really didn't expect an answer. Within hours she emailed me back and although she didn't use a pattern, she wrote out simple, clear, step by step instructions. Who does that? I have trouble even responding to emails from my friends and family. I am inspired both to take this new project on as well as be a better email returner. I hope I can conquer at least one of those goals in the next month or so. I really want to make two, one for each of my girls in their new bedroom and then paint and decorate around it. Am I crazy? I entered too, but unfortunately also did not win-I'm amazed that she emailed you instructions...don't suppose you'd like to share? :) I'm working on a quilt for my baby that's due in a couple of weeks, but I'd love to make one of these as well. Your not crazy! A little ambitious, but not crazy. ;) I can't wait to see what you come up with! nope, not crazy. you can totally do it. i'm a huge imperfectionist, too. you just have to give in to that and lower your expectations: your corners will probably not match up, but that won't take away from how beautiful it will be! what fabrics are you using? You could be crazier. ;) At least it is actually a good type of quilt to start with -- no curves, easy to cut pieces, and straight lines! You totally can do it. The hardest part really is picking the fabric and figuring out how much to buy. And once you make the quilt top and backing, you can always take it to a professional to actually have it quilted, if that makes things easier (that's what I always do). Most quilters rates start at around a penny per square inch, which, in my book, is a bargain. Be sure and post your progress for us to see! Being normal is overrated! Go for it! You can do it! I have done quilts that pattern, it is my favorite because it looks really impressive but if you use the strip quilting method is really not that hard! Good luck! I am an email freak and answer mine freakishly quick. LOL! I sometimes think it's not such a good thing to do, but that's how I have always been, and since I am a photographer, I have gotten a lot of great comments on my fast responses. do not stress about making the quilts. start small. use some scraps or fat quarters to make doll quilts for your girls. i am a total perfectionist. have pulled out more than 100 stitches because i didn't like the way they looked. yeah, i know, weird. you can totally do it. plus twenty years from now your girls won't be looking at the mistakes, but the love that it took for you to make something for them. you can do it! !